Posted 18 November 2013 & filed under 1950s, Life and leisure, Places and spaces, Post World War 2, Russ Bowman, Streets. Russ Bowman recalls living in Lee Lane in one of the new prefabs. Lee Lane no longer exists. Russ explains exactly where it used to be in Holyrood Crescent. He talks about living in the prefabs, the surrounding area and the wildlife the children searched for when they went out to play. Russ and I met when Mandeville School first opened. We did just about everything together in those early days. 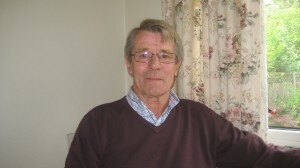 I would have been hard pushed to remember a tenth of what Russ recounts, but hearing his reminiscences brings it all back with remarkable clarity; from school teachers, to hiding under his parents’ kitchen table in thunderstorms, scrumping,illicit fags inour favourite tree in Sopwell Lane, catching slow worms and climbing trees on the railway bank and then cycling three miles or so a day to grammar school. I’ve still got the picture of the street party with Russ and me clearly in evidence. 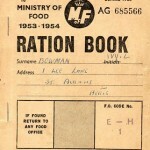 As he said hard times but good times; make-do-and-mend, end of the week economy meals, but lots of fun, laughter and mischief with little to worry about unless you were caught pinching off-ration sweets in the general store in Tavistock Avenue when a good telling off with the threat of telling parents was the only deterrent needed. I lived in the prefabs in Lecturn Lane just above Lee Lane. 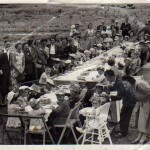 I remember the street party and can see in the photo, myself, sister, dad, mum, and also the Carters’, Burfileds, Foxes’ and Busbys’. I also remember a boy named Roger who lived in Lee Lane. Many great times on that railway bank and over the fields to play in the river Ver. 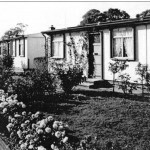 After the prefab we moved to Holyrood Crescent in 1952 or 1953. 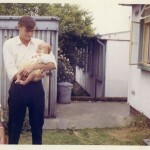 I have a photo of my cousin and I outside our prefab in Lecturn Lane. It would be good if you could post it?